So Much Good Summer Theatre! June 1-17 A Funny Thing Happened on the Way to the Forum at Grand Rapids Civic Theatre. Read a great article about the show on www.mlive.com or get more information at Civic’s Facebook page or on the Grand Rapids Civic Theatre website. June 6-9 Living on the Edge: Evil Things by Actors’ Theatre in Spectrum’s black box theatre. Join us for Actors’ ten minute play festival. Go to either Actors’ Facebook page or website to learn more and read the complete line up of plays. Note: Seating for this production is general admission and limited to 50 seats per evening, advance ticket reservations are recommended. June 7 – 23 Escanaba in Da Moonlight at Circle Theatre. MLive.com also has great article about this this production, and you can learn more on Circle’s Facebook page, or on the Circle Theatre Grand Rapids website. June 14 – 24 Checking Out at Jewish Theatre Grand Rapids. JTGR has show information on Checking Out on their website and their Facebook page. June 21 – July 1 Love’s Labour’s Lost performed by Pigeon Creek Shakespeare Company at Dog Story Theater. Get the full information on the production at Pigeon Creek’s website or at Dog Story Theater’s website. July 12-14 Medea by Heritage Theatre Group at Spectrum Theatre. Learn more about this production on their Facebook page. Looks like it is going to be a great couple of months of theatre! You are not going to want to miss this year’s Living on the Edge! Actors’ Theatre will present five 10 minute plays, all written by Michigan playwrights. It is going to be a great night of entertainment. LOTE runs June 6th through June 9th, starting at 8PM. Join us next weekend for five new 10 minute plays and support Actors’ Theatre and Michigan playwrights in the process! Note: All seating is general admission with only 50 seats available per performance. Every year seats go very fast for this, so make sure to order your tickets early! Tickets are only $10. Order your them today by clicking the link below. Living on the Edge IX: “Evil Things” Next Weekend! Each year, for the past nine seasons, Actors’ Theatre Grand Rapids has issued a call for ten-minute play submissions in the fall, five of which are selected for full public performance. 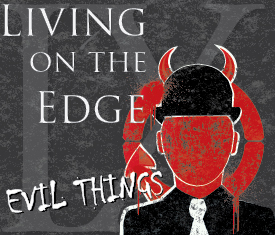 The theme selected for our ninth annual Living on the Edge series is “Evil Things”. On Saturday, April 28th, 2012, ten semi-finalists were read publicly from this years submissions – which was restricted only to Michigan playwrights. “Basement Story” by Austin Bunn – When his mother decides to sell his childhood home, a young man returns to help clean out the basement and rediscovers traces of a dark childhood game that never really ended. “Basement Story” is an unsettling exploration of mental illness and loyalty between twin brothers. “The Ground is Heavy” by Andrew Wernette – A soldier in a war zone, a betrayed wife, and a new father all tell their overlapping and life-changing stories. “Chapter and Verse” by Mike Smolinski – In the distant future, archeologists Jack, an expert, and Louise, a recent college grad, are at a dig that is close to uncovering artifacts from the early 21st century. “Price Check” by David MacGregor – A freshly-hired clerk at a dollar store discovers the dark secret behind his new job. “Sweetie” by Kristin Hanratty – It’s man versus man’s best friend when a normally good-natured dog bites a guest at a dinner party; but does the attack show the viciousness of the pet, or reveal something about the victim? We would like to thank all of the Michigan playwrights who submitted work on this year’s theme. Tickets are only $10, General Admission with only 50 seats available per performance, and can be purchased by calling the box office during regular business hours or online by clicking the link below. Join us next weekend for five new 10 minute plays and support Actors’ Theatre and Michigan playwrights in the process!